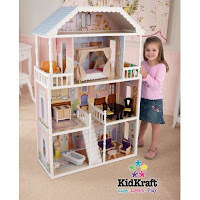 The Savannah Dollhouse by KidKraft is a popular pick this year if you are looking for dollhouse for girls age 3 years old and up. The Savannah Dollhouse is a large 6 room mansion that stands over 4 feet tall! It is decorated as a true southern style mansion and comes completely furnished with 14 pieces of hand built wooden furniture. Very elegant!